your message to someone important to celebrate her (or his) birthday. 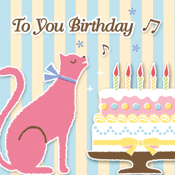 * You need just to sing her (or his) name along with "Happy Birthday To You", then you can send a personalized music as a sound file or a sound file with images (as mp4) to her (or him). * You can include photos from your camera roll into a mp4 file. * You can add text message into the images in a mp4 file. * You can overdub harmony parts into a sound file or ask for someone to merge his (or her) voice into a sound file. Using ToYouBD, you can create a wonderful birthday song to make your girl (or boy) friend, wife (or husband), or someone important very happy.